Caro was born in New Malden, Surrey and read engineering at Christ’s College Cambridge 1942 -1944. He served two years in the Fleet Air Arm of the Royal Navy before enrolling at the Regent Street Polytechnic, London where he studied sculpture 1946 -1947 and later at the Royal Academy Schools, London from 1947-1950. From 1951-1953 he worked as a part-time assistant to Henry Moore. He taught at St Martin's School of Art in the early 1950s and again from 1963 -1974 when his teaching methods became a catalyst for two generations of younger artists. Caro had his first solo exhibition at the Galleria del Naviliglio, Milan in 1957 and his first show in London the following year at Gimpel Fils. His work was shown in the British Pavilion at the XXXIII Venice Biennale in 1966 and at the X Bienal de São Paulo in 1969; he was a prize winner on both occasions. His first retrospective exhibition was in 1969 at the Hayward Gallery, London and his second was four years later at the Museum of Modern Art, New York. In 1992 a retrospective exhibition was mounted in Trajan’s Markets in Rome, and a major retrospective was organised by the Museum of Contemporary Art, Tokyo in 1995. Two large series of sculptures grew out of his immediate contact with ceramic clay in the 1990s: The Trojan War, shown first in London in 1994, and in Athens and Thessaloniki in 1997, and The Last Judgement, first shown at the XLVIII Venice Biennale in 1999. Caro was knighted in 1987 and invested with the Order of Merit in 2000. He lives and works in London. 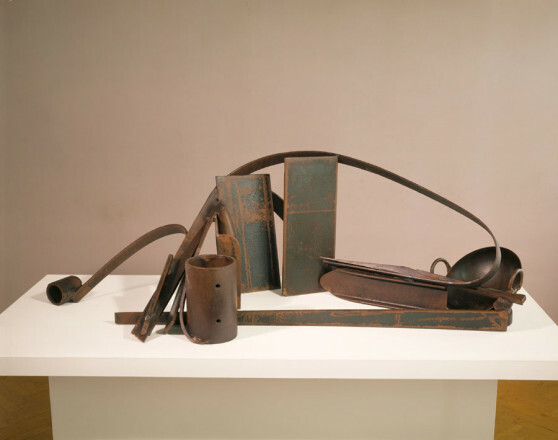 Caro worked in a figurative tradition during the 1950s but following his first visit to the USA with a grant from the Ford Foundation in 1959, he changed his materials from bronze to steel. In a radical break with all he had done before, he began to make abstract coloured sculptures which were independent of base or pedestal so that they inhabited their own space. His achievement was to rid sculpture of any associations with objects and images from the outside world, in particular the human figure. 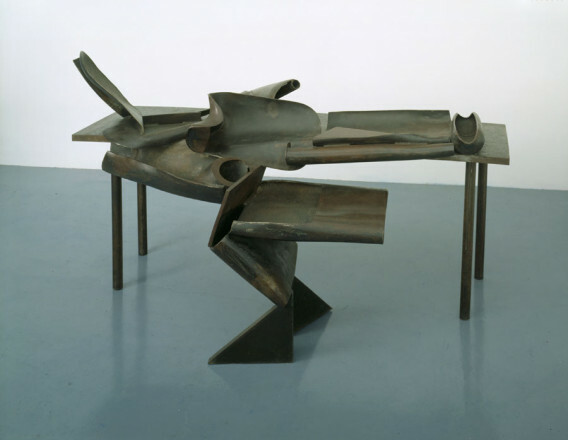 The first major showing of the steel sculptures was in a solo exhibition at the Whitechapel Art Gallery, London in 1963, with his first New York exhibition the following year. 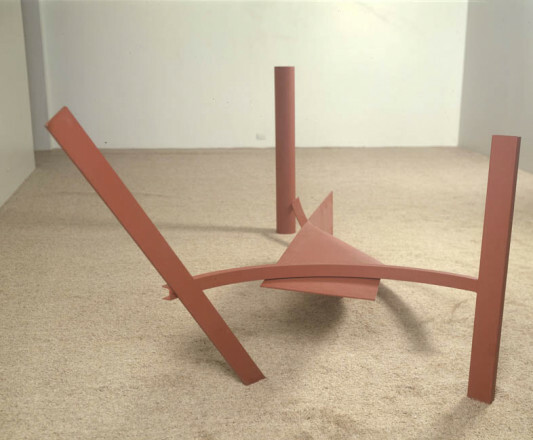 Pink Stack, 1969, is from Caro's first decade of painted steel sculpture. He stopped using colour in the early 1970s to allow the properties of the material itself to become more dominant and assert the power of the sculptural form, though he has returned to using colour on occasion since. Over the last four decades, he has worked with lead, bronze, wood, ceramic clay, aluminium and paper, but steel has remained his primary material. In 1977 he made a group of sculptures at Emma Lake, Saskatoon, Canada. Emma Dance, 1977/78, forms part of this series. Using lighter steel sections and tubing, the Emma sculptures have a linear quality, conveying a sense of weightlessness, a notion of 'drawing in space' which has been a constant throughout his career. It is particularly apparent in many of his 'table sculptures', the earliest of which date back to 1966 when he was exploring ways for making smaller works. His answer was to introduce elements such as handles of implements, the scale of which was immediately apparent, and for the table to work with the sculpture rather than simply being used as a base or pedestal. Table works have formed a large part of Caro's total output, ranging dramatically in scale but in each case the sculpture overhangs, cascades from or grips the table.